Organised by the Cyprus University of Technology, Department of Communication and Internet Studies, this exhibition presented works by selected participants of the SMC2018. The NeMe Arts Centre showcased an installation comprising of three works, Watchers by Daniel Bisig (CH), using interactive sound compositions by Philippe Kocher, Martin Neukom, and Daniel Bisig, a suspended installation, Promenade by Martin Rumori (DE/AT) and a series of large posters documenting the historical contribution of Iannis Xenakis and the UPIC by the Centre Iannis Xenakis (FR). Watchers and Promenade. Anecdote, everyday life, the two featured but visually minimal works filled the NeMe Arts Centre with ambient and interactive sounds, responding to the spatialities of their immediate physical environment but also to the movement of the visitors. 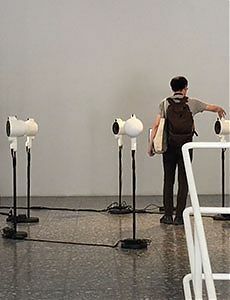 Watchers could be experienced both as a sculptural work and musical interface consisting of six custom-made, 3D printed loudspeakers and open-source electronics. The loudspeakers communicate with each other via IR transmitters and receivers and thereby control the algorithmic music running on a computer. The aesthetic and experiential outcomes are as much based on the ever changing visual and aural compositions as they are mechanically manipulated by the visitors. In contrast, Promenade. Anecdote, everyday life by Martin Rumori initially appears like an esoteric, static work which does not immediately indicate its sensitive audience engagement. Composed of five white tableaux suspended from the ceiling, emitting ambient, algorithmic compositions via small loudspeakers exciting their surface from the backside. These tableaux, reminiscent of minimal artworks, allowed the visitors’ imaginations to focus on the auditory environment’s hues, enhanced also by the subtle changes of light and shadow in the space. They created a very intimate aural experience for the viewers who walked from each piece to the next in order to experience the sound fragments of everyday life. The historical aspects of UPIC in Computer music as pioneered by Xenakis in 1977, and developed by the CEMAMu (Centre d’Etudes de Mathématique et Automatique Musicales) was documented on posters. UPIC promoted a graphical, interactive and gestural interface for composition, resulting in a finite piece, very different to today’s raw code driven and audience manipulated, ever changing interactive compositions presented in sound installations. Despite the importance of Xenakis’s contribution, stepping away from the now commonly used GUIs and working directly with raw code bears many social significations where artists have become digitally and technologically savvy enough not only to dream, but construct their own tools. This has expanded the possibilities of music and its relationship with gestural space to our physical environment where it is now the audience who becomes a willing performer and an integral part of the interactive algorithmic composition. To the Cyprus University volunteers, Andri Christou, Froso Nikolaou, Marinos Panagiotou, Nikandros Ioannides, and Thrasos Tilemachou, who helped in the installation and the attending of the space.